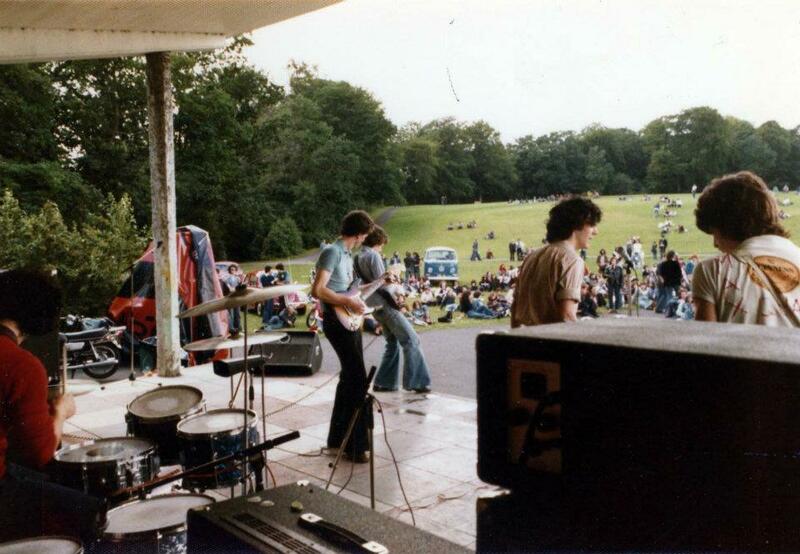 Max Quad Band live in Bushy Park, Rathfarnham in July 1977. Late 70s band from the Navan Road area in Dublin which included Joe Savino (vocals) who later fronted the Brown Thomas band AKA The B.T's but is now better known as an actor (Ballykissangel, Fair City); guitarist Dave/George Sweeney later of Rocky De Valera & The Gravediggers and The Vipers; bassist Alec Clince (ex Exodus) who is still active as a musician and his temporary replacement Adam Clayton (U2); and Rod Quinn (drums), now a highly regarded session drummer (see his entries on the Zildjian and Pearl sites). Joe Savino and Dave Sweeney were both involved with the Passion Machine theatre production in the mid-1980s. Joe Savino and Dave Sweeney were reunited in a number of bands in the 1990s including With A Hip and The Corsairs, the latter featuring Dave Bell on drums and Rachel Peer (Mrs John Prine) on bass. Alec Clince later in Panache, Clowns, Reunion, Dave Lawlor's band, Jigsaw and The Deputees. Brian O'Rourke quit the band and rock music in 1977.